We’re remembering the days of summer camp this week for Iron Craft and making Camp Crafts. 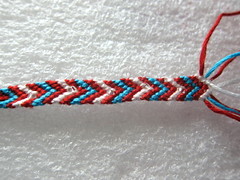 I went back and forth between a few ideas then finally decided I want to learn how to make friendship bracelets. I learned the technique for knotting the bracelets from Honestly…WTF, thanks for the link Susi. Chose the colors of embroidery floss you want to use and cut 30″ pieces of each color (or multiple pieces of the same color if you wish). 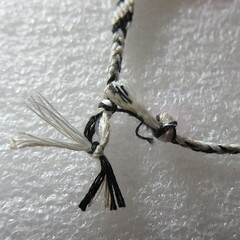 This made the knotted part of the bracelet about 5″ which is about 1 1/2″ shorter than my wrist. Six strands of floss will give you a bracelet about 1/4″ thick. 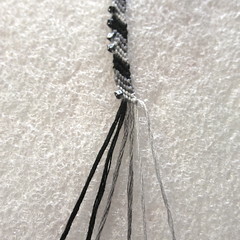 The more strands you use the thicker the bracelet. 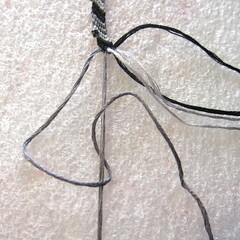 Lay the strands next to each other and tie them together in a knot about 3″ from the top. Pin that knot to your styrofoam or tape it to the cardboard. 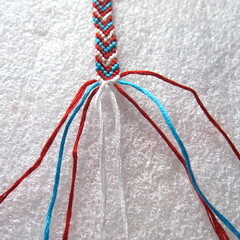 Now lay out the strands in the way you want the colors to appear on your bracelet. 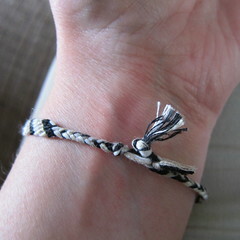 For this simple striped bracelet my strands were black, tan, white, black, tan, white. For my black and grey bracelet I wanted thicker stripes so I went black, black, grey, grey, steel, steel. Starting with the strand furtherest to the left, put it over the next strand creating a sort of 4 shape. Now, take the first strand behind the second and up through the hole in the 4. Hold the second strand taut while pulling up on the first to tighten the knot (if you don’t the strand you are tying around will show through). Now repeat this exact knot with those same two strands. Continue tying two knots with the first strand around each of the other strands in order until you reach the end of the row. You are always knotting with the same color as you move down a row. 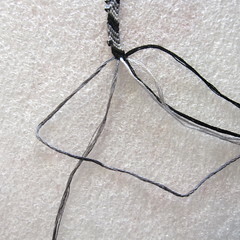 Then you start back over at the left with the strand that is now first (the next color). You will have to pay attention to the order of your strands for the first two or three rows but after that they fall right into place. 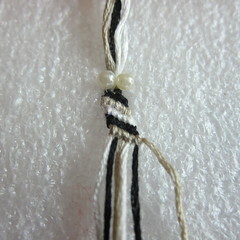 For this example we are putting a bead on the edge of the bracelet. 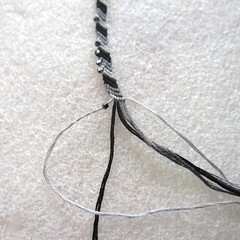 Before you start knotting, thread the first strand onto the beading needle then thread on a bead and move it to the top of the strand (you can remove the needle until you need it again). Now, tie the knots as above. You could so a bead every other row so, they line the whole edge or space them out like I did. 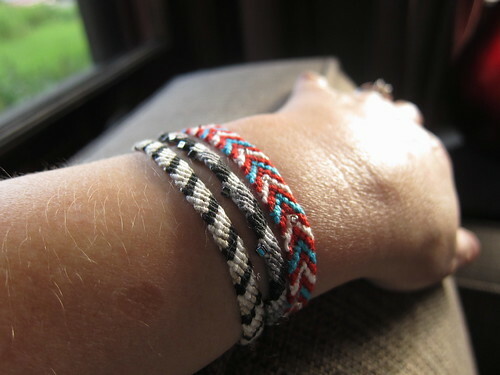 Stop knotting your bracelet when you have about 3″ of floss left. At this point you can just braid the remaining thread and tie it off in a knot. Go back to the beginning untie the knot you started with, braid those threads and tie off with a knot. Then you can just use those braids to tie your bracelet on and off. I wanted to try something a little different so I created a sort of clasp. On one side I tied a large knot. On the other side I made a little loop. To wear it I just put the knot through the loop. I think this will work best when you are wearing the bracelet tightly as the tension helps hold it on. Now, go make a whole armload of these for your besties or be greedy and make them all just for you! Nice! I was just proud to go from a 3 strand braid to 4 strand macrame. Maybe, someday, I will attempt this. It would be a fun, teen library program.